Today's Parental "No" comes from mom and blog reader Shari Kneen whose 9 year old son received the coupon for Pizza Pizza fries from his coach for playing a game of "penalty free" hockey. Is there anything a child does in an organized manner these days that isn't rewarded with junk food or candy? Wouldn't simple praise from coaches and parents suffice for "penalty free" hockey played by a group of 9 year olds? What's in it for Pizza Pizza of course is a whole fresh crop of young customers who will hopefully associate Pizza Pizza with fun, sport, a job well done and reward - messaging they'll potentially carry with them for life and potentially pass on to their own kids. What's in it for the Ontario Minor Hockey Association and the Greater Toronto Hockey League is undoubtedly money. Good business for Pizza Pizza, but a real shame both the OMHA and the GTHL seem to value money more than kids' health when one might argue that healthy kids are their primary businesses. 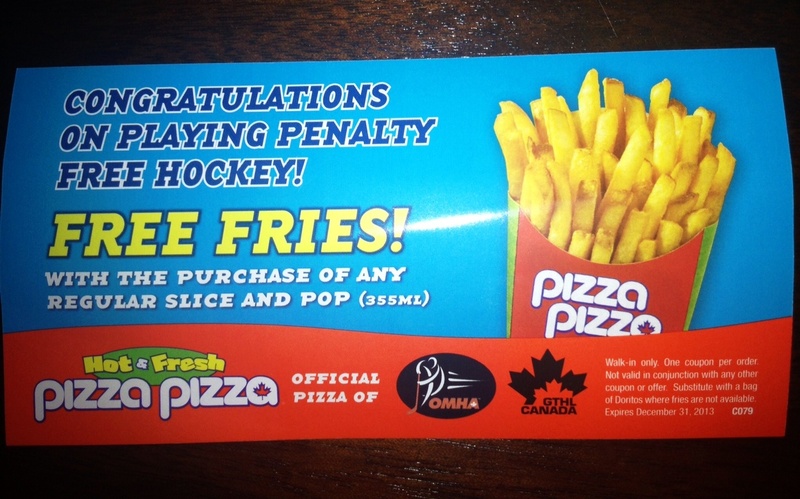 "Just when I thought I hadn't seen food rewards lately on my kids sports teams - here we go again! I hate the message we are sending to our kids. Companies shouldn't be allowed to do this. I blame OMHA for even accepting this sponsor!" Me too Sheri, though to be fair, the OMHA and GTHL probably didn't give a second though to the promotion - society has so normalized this sort of practice that no one even thinks to question it.